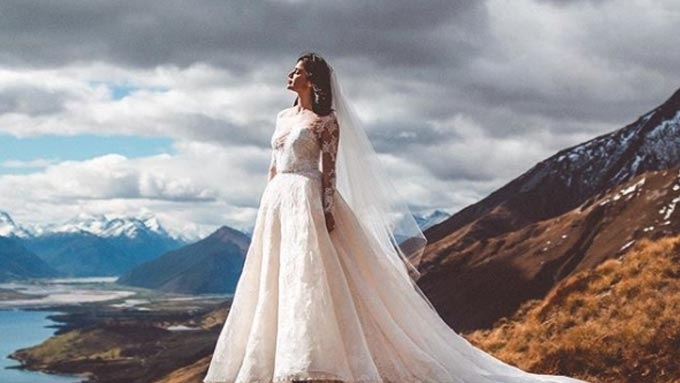 Anne Curtis wore a custom Monique Lhuillier wedding gown during her breathtaking New Zealand wedding with Erwan Heussaff last November 12. The outdoor garden wedding of Anne and Erwan Heussaff last November 12, in Queensland, New Zealand, had many wonderful details. But most precious in Anne's memory was her bespoke Monique Lhuillier bridal gown. In a lengthy Instagram post dedicated to the LA-based Filipina designer, Anne thanked Monique for bringing to life her dream wedding gown. The gown took ten months to make with Anne taking four trips to Los Angeles, California, to fit her dress at Monique's atelier on Melrose Avenue. “With each visit, the dress just blooming into life!” Anne recalled. “I can’t even express in words how I felt the moment you first put on a veil on me and then again when I put on the dress for our last fitting. PART OF THE FAIRY TALE. In her own Instagram account, Monique also expressed her gratitude towards Anne. Days after Anne and Erwan’s wedding, Monique sent her well-wishes to the bride through the post. The Pinay designer wrote, “This beautiful soul came into our lives 10 months ago. “She was committed to creating the gown of her dreams. The in-demand designer only makes about ten custom wedding gowns in a year.